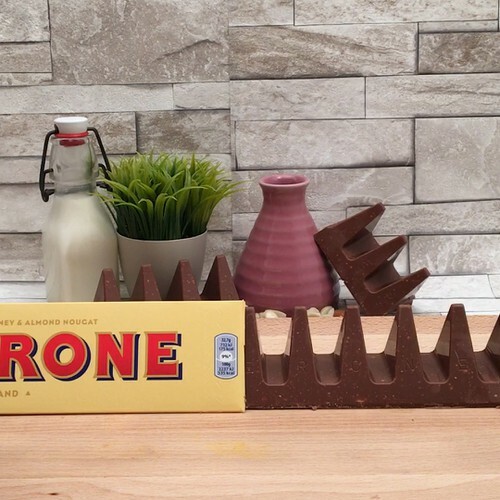 Blend 2 Toblerone bars until you get small pieces. Mix the pieces of Toblerone and the melted butter together. Cut one Toberlone bar into triangles and arrange them around the edge of a round sprung cake tin. Then spread the Toberlone and butter mix in the space in the middle and smooth with a spatula. Using an electric whisk, beat the cold cream and mascarpone in a bowl to get a whipped cream. Melt ¾ of the remaining Toblerone in the microwave and gentle stir into the whipped cream. Pour the mixture into a mould and smooth the top with a spatula. Place the cake in the freezer for 45 minutes and decorate it with grated Toblerone and toasted flaked almonds. Serve straight away.